I had to put a pic of Angelina Jolie in there! Hope you have all had a good week and that it hasn't been too crazy hectic, I cant believe we are already in to the 4th week of Jan...shocking! Anyway as this is sort of the beginning of a New Year the start of new things to come and with some of us going back in to the corporate world like myself (sigh;), I thought this may be useful for those of you who are in the same boat as me and in need of a little inspiration on key items to start off your Workwear Wardrobe with, or maybe you are just looking to revamp your Workwear look. I have decided to go with 5 Items as I didn't want anything too complicated to start off with, this is realistically close to what I currently have at the moment and would be a great start for anyone. Starting off with a white shirt, this is definitely the one item that everyone must own. Easy to wear, easy to style, effortless, smart, chic, dress up, dress down....you get the gist. I know there is a lot of this style out there at the moment, but where it is an A line skirt I feel most body shapes would get away this, again really easy to wear and something that you don't have to put much thought in to when matching it up to another item in your wardrobe. Finding a blazer that is cut right and fits well to your body will immediately take your outfit to the next level. 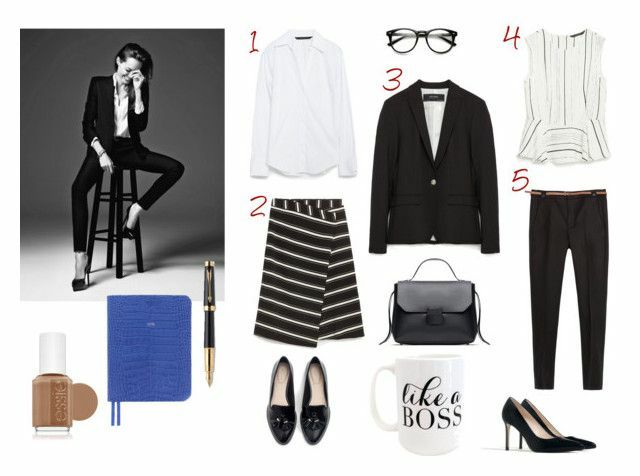 You will somehow look smarter and more professional when wearing a well tailored blazer. This is always a handy item to carry in your wardrobe if you have an important meeting or interview to go to. Sometimes you want a change from wearing a shirt everyday and all you want to do is throw on a pretty, feminine, fashionable top that will easily pair with a trouser or skirt in your wardrobe. Last but not least, where can you go wrong with a pair of black trousers?! They go with everything. Hope you have found this post useful. Have any of you started a new job recently? Are their any items you would of added to this list or chosen differently?